Introduction: The incidence of corpus callosum infarction is low, and sudden cognitive dysfunction caused by corpus callosum infarction is very rare. 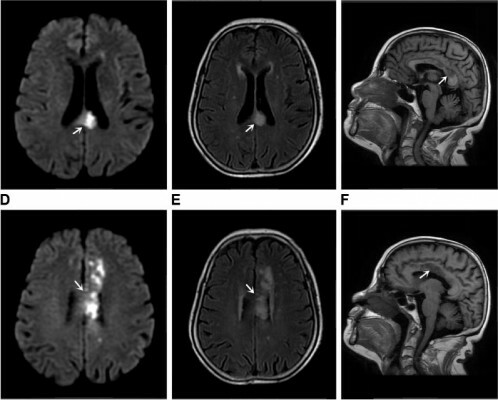 We report two cases of acute corpus callosum infarction with sudden cognitive impairment, and the related basis, clinical manifestations, diagnosis, differential diagnosis, treatment, and prognosis of this disease are reviewed. Cases presentation: The two patients had sudden and severe memory impairment and spatial orientation disorder. Their cognitive function scores were significantly lower, and their MRI demonstrated clear corpus callosum infarction. Through treatment, the symptoms improved significantly. Discussion: This paper reports two cases with corpus callosum infarction with sudden cognitive impairment, and its relevant background is also reviewed, which will help doctors with the classification diagnosis of cerebral infarction and understanding of corpus callosum infarction.